This is a guide to the paddling experience that can be had on the Hoosic River and its larger tributaries. The Hoosic is a three-state river. It forms in the Green Mountains of Vermont, the Taconics of New York, and the sides of Mount Greylock - the highest mountain in Massachusetts. The river runs seventy miles from its headwaters south of the Cheshire Reservoir in Massachusetts to the community of Stillwater, NY, on the Hudson River. It's watershed covers 720 square miles. Major tributaries include the North Branch, the Green River, the Little Hoosic, the Walloomsac, the Owl Kill, and the Tomhannok. 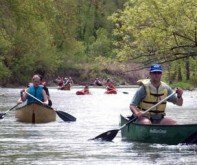 This is a guide to the paddling experience that can be had on the Hoosic River and its larger tributaries. The Hoosic is a three-state river. It forms in the Green Mountains of Vermont, the Taconics of New York, and the sides of Mount Greylock – the highest mountain in Massachusetts. The river runs seventy miles from its headwaters south of the Cheshire Reservoir in Massachusetts to the community of Stillwater, NY, on the Hudson River. It’s watershed covers 720 square miles. Major tributaries include the North Branch, the Green River, the Little Hoosic, the Walloomsac, the Owl Kill, and the Tomhannok.